The 2015 Epsom Derby takes place on June 6. 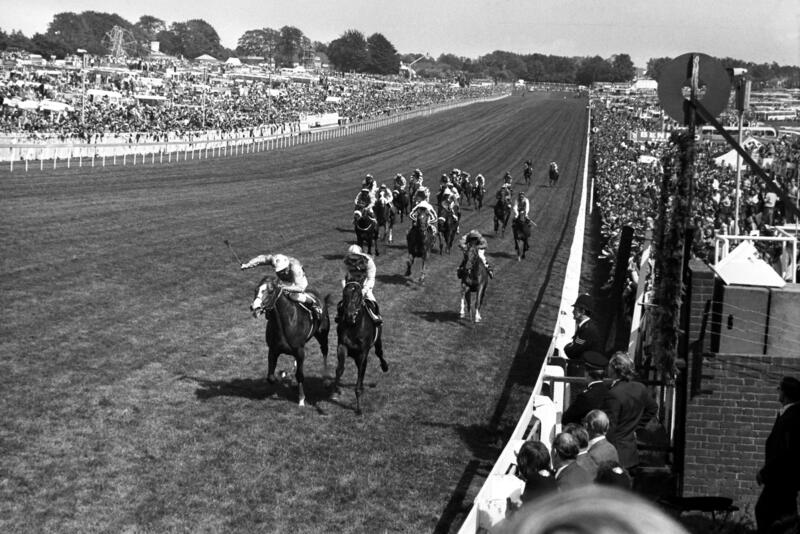 Amongst the illustrious names to win the Derby was The Minstrel (left) in 1977 for Lester Piggott. Hot Grove was second and Blushing Groom third. (Pic courtesy of Jockey Club Racecourses). Investec Derby favourite Jack Hobbs is set to clash with co-second favourite Elm Park in the Group 2 Betfred Dante Stakes at York on Thursday. The John Gosden-trained Jack Hobbs is as short as 4-1 for the Derby with Coral and best priced at 6-1 after winning both of his starts. The Andrew Balding-trained Elm Park – winner of the Group 1 Racing Post Trophy as a two-year-old – is considered a chief rival by bookmakers who price him at 7-1 alongside Zawraq and John F Kennedy, but as big at 10-1 in places, for the Investec Derby on June 6. Elm Park is set to have his first start of the season in the extended 10 furlong contest on Thursday, where he clashes with Jack Hobbs who looked mighty impressive when winning by 12 lengths on his comeback at Sandown last month. The son of Halling had been heavily supported all day and justified market confidence at the Esher racetrack where he raced close to the pace before bursting clear a furlong out to win, eased down, for Frankie Dettori. Gosden revealed after the Sandown victory that the Dante was an option, and the colt has since been installed as the 2-1 market leader for the race by sponsors Betfred. Speaking to the Guardian immediately after the Sandown win, Gosden said: “He might be ready for a trial now. You see why he’s only run once, in December, big rangy boy. In other news, Jack Hobbs’ stablemate Christophermarlowe – who had been as short as 14-1 ahead for the Derby – was sent off at 2-5 in the Listed betfred.com Derby Trial Stakes at Lingfield on Saturday but could only finish third behind Kilimanjaro. The winner was given a quote of 25-1 for the Derby (Coral), while they have eased Christophermarlowe to 33-1. Paul Smith, said on behalf of winning owners Michael Tabor, Derrick Smith & Mrs John Magnier said: “That was really good. He’s progressing all the time. He settled beautifully and he is learning the job quite quickly.